I know I think I would just be so stunned to see him balancing like that!!! Boost is walking on 4 legs all the time now and doing better then ever! the surgery was really worth it! 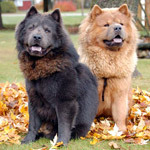 If your chow has hip displasia get him operated! boost is already running and jumping! hes a much happier dog now! i got my baby chow chow back! I am so glad to hear he is doing so well! Glad to hear your chow is back to being happy again..that's good news, was there much physical therapy? I've been "lurking" on this post and can't NOT comment. How HAPPY I am to hear your good news!!! Boost is a trooper!! I'm so glad that you got your boy back!! So glad to hear that! Thanks for all the advice...my baby turned out to not need hip surgery, her cruciate is what is causing her problems. Now that the palate reduction is done and she can undergo the long anesthesia for the CCL repair we are hoping to have her fixed up soon! That is possibly the cutest thing I've seen a Chow do! He looks really cute without his fur and he is VERY LUCKY to have such wonderful, caring owners! Heres a video of him, scared of a rc helicopter! Good thread on this forum. I have read many threads here and all are too good. Glad to hear that the surgery goes well.